I saw this idea for packing salads in a mason jar, but it's no problem for me to make up a salad whenever I want and then they're fresh. The other thing that I've been eating my bodyweight in, though, is fruit. Boy I've practically been anti-fruit, and now I can't get enough fruit. I discovered cut fruit, is what. I live by making good food as easy to eat as possible; but if you're eating four or five quarts of cut fruit per week, the plastic containers add up. I guess the bought cut fruit got me to eat fruit and now that I like fruit, I'm willing to do a little work to cut my own fruit. Bought cut fruit was a gateway fruit. 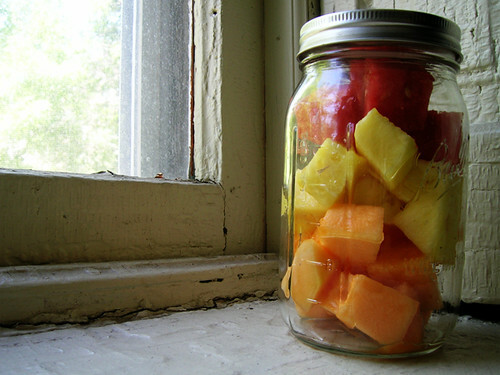 It's not like I don't already own containers I could use for cut fruit. The mason jars are cute, the better to motivate me with.